Because it it stainless and forward sealing. It got very good reviews and I like the ability to thread on adapters. To get beer out of the keg. Matches other forward-sealing faucets in use. Because recent experiences with chrome Perlick have not been good. The internet says they're as good as perlicks. I wanted the best faucet available and after research, this is it. I also love the flexibility of being able to change the the spouts. Own two already and love them. This is my second faucet from Intertap. Very high quality. Have 2 and love them. Need 2 more. It is not chrome plated brass that wears out and gives your beer an off flavor. Completing my upgrade. I liked the first two. Better feel and less dripping, foaming. Have one already and love it!! because of the interchangeable tips. Reviews and ratings were very good for this product. Are these the first or second generation version of the taps? BEST ANSWER: Hi Christopher - We now carry the G2, generation 2 faucets. They work very well. Don’t stick like the standard taps. Easy to disassemble and clean, and leak free. Recommended for any dispensing application. I like this faucet. I really like the construction, the stainless steel and of course the price. I would give it 5 stars but it has a little rattle to it when used. I did not purchase the springs that would enable the auto shut off, maybe this would make a difference by keeping tension on the inner parts and keep them from rattling. I purchased two to try them out. I like them enough that I plan to purchase three more to complete my tapper set up, and I plan to order the springs and also the stout adapter!! I’ve bought a lot of faucets looking for for a good one without having to spend a ton of money (I have a total of ten taps). I would recommend this faucet. Great faucet. Never sticks and pours well. Anyone who has ever had a stuck faucet would appreciate this upgrade. I got this specifically for the ability to change the nozzles on the end. I'm very pleased with the quality of the tap, even compared to others I had purchased previously from Amazon stores. I'll definitely be back! Love the faucet. I would definitely recommend the Intertap shank as well as spring to allow for the automatic shut-off. Beautifully engineered! Now that I see this in person I can't believe the price. Definitely well worth it. I just hooked it up to my kegerator and it meets all expectations. I love the forward sealing design and the fact that I can unscrew the spout and add other attachments. I will be converting my other faucets to intertap. It's a no brainer. Intertap: Quality Forward Sealing Faucet! Beautiful stainless faucet! Everything is machined to tight tolerances, and they have a very positive open/close feel - especially with the springs installed. I have the internal springs in all four of mine, and it really contributes to a full closure (no drips). 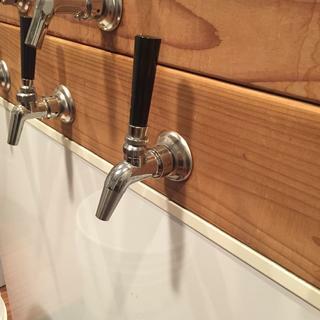 Couldn’t be happier with the Intertap faucets on my keezer! The faucet we had prior to would continually gunk up and get stuck. This Forward-sealing faucet never gets stuck! Replaced the basic taps that came with my Kegerator that were constantly sticking. These taps are very well made and seemed to have solved the problem. THey also pour much better that the old taps. Works as expected. Happy with the purchase! first thing first. clean the crap out of these before throwing them into use. i initially performed a hot soak in 180+ water and put them into use. we have a brewery tap room and the head had giant bubbles and there was no head retention whatsoever. i pride the fact we have very stable head and lacing and the beers didn't. the next morning i completely tore down each faucet and soaked in hot caustic and then scrubbed each part thoroughly and then rinsed thoroughly and reassembled. all is better now. so far so good. i am interested to see how these hold up against our perlicks. quite a bit cheaper but way more parts in each faucet compared to a perlick. Like this much better than my old Perlicks, and by installing a spring, no more accidental pours. This is a great tap. The spring for auto close helps my drunk friends remember to shut the tap off. I love this tap. Buy the spring too. It works great with non- intertap shanks. Works like a champ at a price I can afford!! Overall these are nice faucets. I was having problems with my Perlick 525 faucets leaking at the top so thought I'd give these a try. Maybe they will break in but they aren't as smooth as the Perlicks but I do like the fact that I could purchase a stout tip so I don't have to change out the whole faucet. It's not exactly like nitro but makes a super nice creamy head. I wasn't sure I needed the growler tip but thought I'd give it a try and I'm super happy I did since it actually pours with quite a bit less foam than the type that insert up into the tip. Nice faucets.Stout tip is nice, growler tip foams less than adapters that go up into the faucet tip. After my Kegco tap froze in place for the millionth time and the lever broke while I was trying to crack it open, I was in need of a new tap. I did some research and chose Intertap. The package from MoreBeer! came quickly, and it only took me a couple seconds to install the new tap. Not only does it open and close smoothly, but it looks great too. I am very pleased and plan to purchase more to fill out my tower. 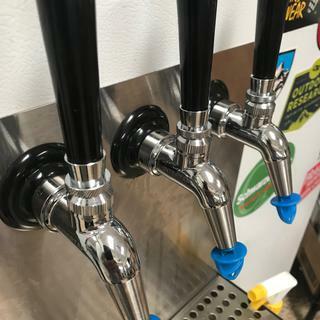 I replaced all three of my taps on my keezer with these Intertap Forward Sealing Stainless Steel Beer Faucets. So far they are working well - no drips. I added the optional springs so they snap closed when I let go. I would recommend spending the extra couple of dollars for the spring. Excellent product, plan to use only these for all future keggerator builds. Love that they only drip once after being closed. My old perlicks never sealed reliably, would dribble if you looked at them wrong. I recommend this faucet to anyone who cares to listen. Seals great. Build quality is top notch. Opening it feels right. The gadget spouts are a nice bonus. Have perlick beside these. I'd buy intertap again, not just because it's more affordable. Easy to install on my existing shanks. Replaced the cheap chrome plated taps, and what a difference. Less foam and better flow. Love the interchangeable heads and the no drip design. Swapped out Perlick for the Intertap. Really like the ability to swap to the growler filler with a twist. Great faucets. Couldn’t be happier! I bought these to replace my Perlicks on my outdoor keezer that were constantly leaking. These have been leak free and work great! Man, people really like intertap? Why? I bought a single intertap faucet to replace one of my Perlicks. I'm going to put my Perlick faucet back on. The Intertap faucet feels rough. Like a little grind every time you move it forwards or backwards. Feels cheep and poorly made. I was excited about the attachments until I tried using them. See my other reviews. Plain and simple, they are all poorly thought-out gimmicks. They are not suitable for actual use for their advertised purpose. 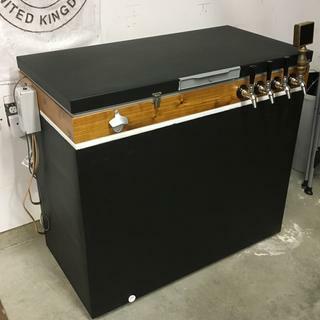 I ordered this to be my 3rd tap that I added to my kegeratorI love it. The stout nozzle definitely swayed my decision to buy it. I will see how that part of things works when I get my notro all set up. This is a great faucet. The only reason I gave it 4 stars instead of 5 is purely cosmetic. I wish they would electro-polish the spout so the finish would match the polished faucet body. but for the wonderful price, looks, and operation...and I can't believe that I would ever say this...but these intertaps are the best thing out there! now if only I can catch the add-ons in stock, I know I really am quite interested in the growler filler at the very least. I had two 500 series Perlicks that after a few years of use I could not get to stop leaking. After a few garage floods and failed fix attempts I decided to give these a try. I have used these for about a month and they have surpassed my expectations. The pull is smooth yet very solid. The tap almost seems to click into place when closing. They look good and pour a beautiful pint. an amazing faucet, for a fraction of cost! Purchased one of these faucets, found it was far superior to Perlicks in more than one way. The first of course is the price, which is significant in reduction to the Perlick faucet, for the similar design...but that also was the second reason as well. The forward sealing function does what it sets out to do: stops drips! Sure, there will be the errant few drops just after finish, but it's top notch. Third and the more amazing part, it's scalability. With this faucet, I also purchased a stout faucet nozzle. To give you an idea of how important that is, imagine needing to buy a specific stout faucet, that can set you back $74.99 for the one faucet that does ONE thing! 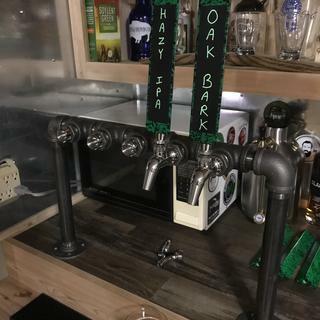 I now have a faucet which can be used like a regular faucet AND a stout faucet on the fly! All that, for a bit over $33.00!! Great going Keg King and MoreBeer!